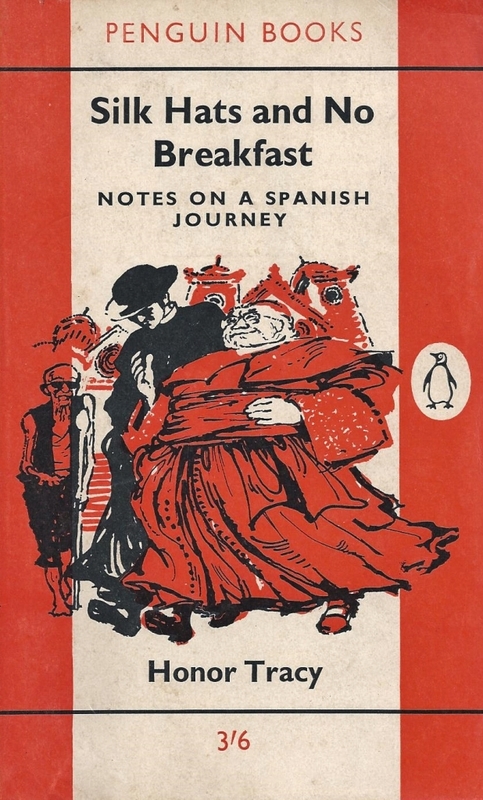 Silk Hats and No Breakfast: Notes on a Spanish Journey by Honor Tracy ~ 1957. This edition: Penguin, 1962. Paperback. 190 pages. New to me with this book is this writer, one Honor Lilbush Wingfield Tracy. Born in England in 1913, Honor Tracy seems to have been involved in the world of the written word from early on, with her first job being in a London publishing house. She went on to work in wartime intelligence for the British government, and then as a newspaper columnist and foreign correspondent, eventually turning out a number of well-received travel memoirs as well as a respectable number of satirical novels. Honor Tracy, according to the biographical write-up in my vintage Penguin paperback copy of Silk Hats and No Breakfast, generally spent her summers in “a village near Dublin”, and her winters in Spain, making her something of an accepted authority on both countries and a translator of both Irish and Spanish quirks and eccentricities to her English readership. She also wrote a book, Kakemono, about her 8-month stay in Japan in 1948, which piques my interest, for if Silk Hats is any indication of her general technique, Honor Tracy would have written with brutal accuracy her impressions of that war-torn land and the reception she received from its people. Silk Hats and No Breakfast recounts a summer journey – June till September, 1956 – made into Spain, from Algeciras to Vigo, with numerous side excursions, over something like 1200 miles of road (the author’s rough estimate) travelled by public transport (mostly bus) and hired taxis. Though well-prepared with an itinerary of what she wished to see, and with abundant prior experience in Spanish travel, Honor Tracy rather gallantly threw herself to the mercies of fate regarding her accommodations and meals. She goes with the first hotel tout she meets at each bus or railway station, and ventures into any number of local (versus for-the-tourist) restaurants, cafes and bars, sometimes with wonderful results and fantastic food, and other times not quite so fortunately. This sounded like an interesting travel memoir, and I had very high hopes for it, and it met many of my expectations. It is good – very good, really- but I wouldn’t go so far as to call it “great”, which is, of course, only a reflection of my own individual likes and dislikes for books of this genre. Honor Tracy writes with skill and precision, and she is mostly acceptably interesting, though after a while I started to lose track of exactly where we were supposed to be – place names being lavishly provided but with little explanation of context, as if the reader is expected to be as familiar with the intricacies of the Spanish map as the writer obviously was. There is, however, a continual bitter cynicism to her tone which keeps one from getting too close to her, as it were. The best travel writers have the reader stepping along as a firmly attached shadow; with Honor Tracy I get the feeling that I am very much an audience member, and an uncritical one at that – she can say anything she likes and can indulge in sarcasm and asides, and I am expected to nod and smile and not say anything in return. That probably doesn’t help you much with deciding if this is your sort of thing, does it? I should probably include a few excerpts, so you can get a taste of this writer’s flavour for yourself. I’m rather curious about her other works, and am debating tracking down the Japanese memoir, as well as some of her fiction. She’s very readable, as long as one is prepared to be the recipient of some rather brutally opinionated asides, mixed a bit confusing with frequent warm approbation of the people and country she is turning her journalistic X-ray eye upon. (At the start of the journey, visiting with a friend and fellow writer, Gerald Brenan.) All along the hilly path to the shore we talked about Spain, and when at last we reached Torremolinos we sank into chairs at a café and talked about it further. Gerald Brenan knows the country as well as any Englishman alive and he shares his knowledge with the ignorant in a splendidly open way. When two or three English people are gathered together in the Iberian Peninsula inevitably at some point the question of animals comes up, and it was startling to hear him say that Spaniards love them as we do. They might think it unseemly, obsessed as they are with their own human dignity, to fondle a beast, but their attitude was not the cruel or indifferent one that foreigners supposed. He gave what seemed a curious illustration of the argument: that when domestic creatures are old or sick the owners cannot bear to put them down but will push donkeys and mules over cliffs and leave them, perhaps with broken backs or legs, to die alone; and will turn unwanted dogs and cats loose to fend for themselves among the hundreds and hundreds of strays already starving. This unwillingness to take their lives directly, he thought, came down from the Moors: his wife put it down to stupidity and want of imagination: I wondered if it might be simply the helplessness of uneducated people anywhere. But Gerald Brenan said that the reluctance to tamper with life went through all classes, and gave as example doctors, who will refuse morphia to an agonizing patient if it is likely to bring death any the sooner: adding, wryly, that this attitude disappeared at once the moment passions were aroused, as in the Civil War, when people would be slaughtered to left and right. Tracy consistently points out examples of animals being routinely abused (by all accepted English standards) – donkeys and mules bearing staggering loads, emaciated draft animals, starving stray cats and dogs haunting street cafes and garbage piles for scraps – and she seems to relate this casual acceptance of animal hardship to the frequently dire physical condition of many of the “common people” she observes. There are descriptions of the many beggars and street people in varying degrees of physical infirmity, which she includes as frequently and as soberly as the accounts of the animals. One wonders what a Spanish observer would have to say about this same situation? – and what the situation regarding animal and human welfare is in a more modern Spain, given that Honor Tracy’s journeyings there occurred well over a half-century ago. (Tracking down a “great beauty spot” recommended by travel writers and locals, but apparently unreachable by any sort of scheduled public conveyance.) In the morning I hired a taxi at frightful expense and drove to the Lago. The scene deserved all that was said about it: a great expanse of water, clear green and mirror-smooth save where now and again a breeze fretted the surface, enclosed by mountains with fields of pale gold corn all over their lower reaches. I have never seen an inland lake of greater beauty in Switzerland or Yugoslavia or anywhere else; and except for a girl washing clothes at the edge of it it was quite deserted. No bathing cabins, refreshment stalls, or boats for hire, and not a soul in sight: and, better than that, not a sound to be heard but the girl chanting a melancholy little tune to herself or the ripple of a leaping fish. After the eternal brouhaha of Spanish life, this lovely peace was far more than the mere absence of bustle and commotion, and I lay on a rock in the sun almost drunk with it, fervently blessing the tourist officials for their lack of enterprise. Presently I went to swim: the water was warm and not icy-cold as described in the literature, but no doubt the author of this, for want of conveyance, had been unable to make a personal verification. As the morning wore on one or two motor-cars drove up and by lunch-time there were about fifteen people on the sand, among them some enchanting little brown baby boys, each with his peaked cap to protect him from the sun and not a stitch of anything else: with whom their papas constantly played as if they were dolls, unable to leave them. alone for a minute and fussing over them a great deal more than the mothers.